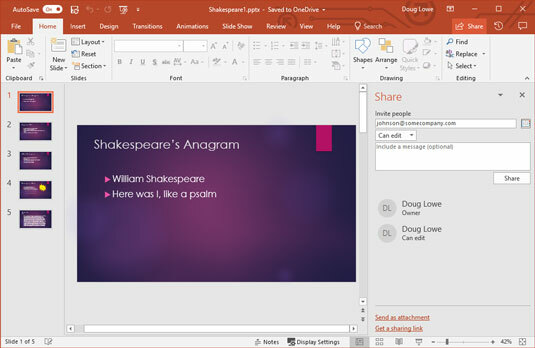 You can easily share a PowerPoint 2019 presentation with a friend or colleague by sending an invitation via email. The invitation email will include a link that will open the presentation in a web-based version of PowerPoint called the PowerPoint Web App. From the PowerPoint Web App, the user can view the presentation. 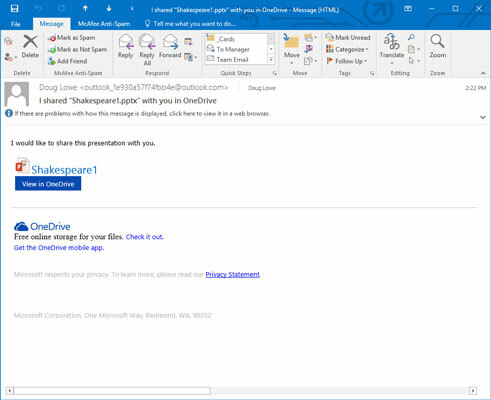 If the user has PowerPoint installed on his or her computer, the user can also open the presentation in PowerPoint, edit the presentation, add comments, and save the edited presentation in the original OneDrive location. 1. Save your presentation to OneDrive. 2. Choose File → Share. You are returned to the presentation with the Share task pane open, as shown here. The Share with People page appears, as shown. From this page, you can craft an email message that will be sent to the people with whom you’d like to share the presentation. 3. Type one or more email addresses in the Invite People text box. If you have more than one email address, just separate the addresses with commas or semicolons. You can click the Address Book icon to the right of the text box to bring up your address book. Then, you can select names from your address book rather than type the email addresses manually. 4. Choose the sharing permission you want to grant. The two options are Can Edit and Can View. Use the drop-down list below the Invite People text box to select the permission. 5. If you want, type a message in the Include a Message [Optional] with the Invitation text box. The message is included in the email that is sent to the recipients. A confirmation message appears, indicating that the emails have been sent. The figure shows a typical invitation email. An invitation to a shared PowerPoint presentation. 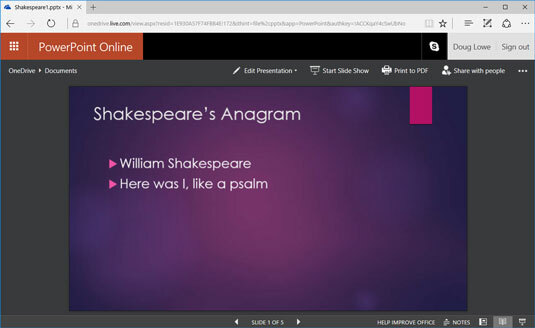 A shared presentation open in the PowerPoint Web App. If you want to manually send your own email with a link that allows users to view or edit your presentation, you can choose File → Share → Get a Sharing Link. This displays a page that allows you to create a View Link or an Edit Link, which you can then copy and paste as needed.